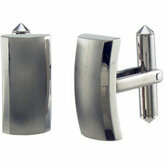 This year we are seeing a lot of men leaning towards jewelry made from titanium as their jewelry of choice. Titanium jewelry has the strength of steel but is light-weight like aluminum so it makes a great metal for jewelry , especially for those who can be hard on their jewelry, like men. Titanium is a metal that is 99% commercially pure, whereas other metals are not as pure such as gold, sterling silver, stainless steel, etc. Jewelry made from Titanium is one of the fastest growing divisions within the jewelry market today. It has the appearance of stainless steel and white gold but the strength of the metal is amazing. You will find men's earrings, neck chains, pendants, bracelets, watches, cufflinks and tie tack pins all made from Titanium out in the men's jewelry marketplace. All of these can be made with gemstones, have carved designs and are interlaced with other metals for a unique and impressive jewelry statement. One great thing about the Titanium is that most jewelers who manufacture and produce Titanium jewelry offer it with a lifetime warranty due to the fact that is is durable and scratch resistant. It will definitely be a piece of jewelry that you can have for a lifetime. Many jewelers are offering it in women's styles too so wedding sets can be matching and they look amazing. 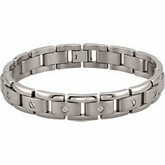 If you are looking for classic or modern designed jewelry for men, you need to check out the Titanium lines. You will be impressed. Titanium is awesome for men, I agree!